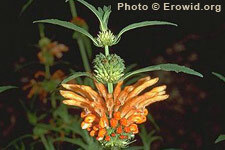 Leonotis leonurus is a shrubby perennial growing 2-3 meters tall and producing red, orange, yellow, or white tubular flowers. The dried flowers, when smoked, provide a mild sedation reminiscent of Cannabis. They have a history of use in S. Africa as an intoxicant.